From beginning to end, Compulsion pulls you in, keeps you guessing, plays with your emotions and leaves you breathless with anticipation. I loved this book wholly and completely, and I can't wait to push it on everyone I know. I actually met Martina before I knew she was an author, and since we are both YADCers (Young Adult DC), we've become friends. I get SUPER nervous about reading books of people I know personally. I mean, how do you say you don't like your friend's book? I just can't. But this book is set in South Carolina! Which is my spirit state. So I had to read it. My solution? I would read it in secret, and if I didn't like it, I would never tell anyone I had read it! Yeah, sneaky, I know! Luckily, I had nothing to worry about. It was more than awesome. It was glorious!! From the very beginning, Compulsion just clicked for me. I loved the writing so much. Martina did such a phenomenal job crafting every piece of this book. The setting, which is an Island in South Carolina, came to life for me. I lived in SC for five years (and vacationed there every summer since I was 5), and reading this made me feel like I was back there. Spanish moss on the old oaks, beautiful plantations, lowcountry cooking and Southern hospitality fill the pages. It was just perfect! 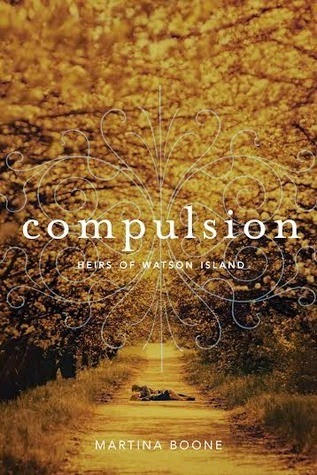 The characters in Compulsion are so fantastically written. I loved that each of them had such a distinct and fully fleshed out voice. The main character, Barrie, was FREAKIN' AWESOME. I loved her so much. She was so snarky! I just wanted to be bff's with her! Don't even get me started on Eight, Charles Beaufort the 8th. I WANT ONE! Wait, I mean I want EIGHT! I like a lot of book-guys. Don't we all? But there was something about Eight that just pushed him right to the top of my list. He was such a Southern gentleman. Eight is twice the man Four is. I'm just sayin'. Simple math. But it wasn't just the main characters who were awesome. Each character in this book became so real to me. I could actually name people who these characters could've been based on. They were so perfect. From Barrie's Aunt Pru, to her drag-queen "guardian" and even her infuriating relatives, I'm pretty sure I've met them all in real life. All the relationships were complex, constantly changing, growing, or evolving. It was just so well done. There are so many elements to this book. The strange gifts that the Watsons and Beauforts have and the Colesworth curse are fascinating. The mysteries surrounding how these things came to be, keep you turning the pages frantically, trying to find the answers. Why Barrie is being drawn to Watson Island? What is calling to her behind the locked doors of Watson Plantation? What is hidden in the Colesworth grounds? The end of this book had my heart racing, and I honestly kept forgetting to breathe. It was SO INTENSE! I had no idea what was going to happen, and let me just say, CLAUSTROPHOBIA! I know what you really want to know, though. HOW WAS THE ROMANCE? Let me just say, it was so good I could hardly stand it! I read that it was insta-love, but that's not the case at all. Barrie and Eight are drawn to each other because of the "curse," but Barrie fights against that pull like a prize-fighter. She will not be controlled by anything but her own feelings, which she takes her sweet time figuring out. I mean if Eight was standing there in front of you, being all gorgeous and amazing and Eightish, what do you think you would do? I loved their relationship. I loved the banter between them, and the way that Eight protected and cared for Barrie, but was never afraid to tell her how completely infuriating she was being. Just. So. Good. As you have most likely guessed, this book has shot to the top of my all-time favorites list. There's rarely a book that I connect with as fully as I connected with this one. Rarely a book that I want to read over and over. This is that book, and I can't wait to share it with the world! I hope you love it as much as I do. I can't wait to read this! Martina is coming to Charleston in November as part of the Compelling Reads tour, and we are so excite to have her! Yay! So glad you liked this. Me too. SO excited for this one (not to mention meeting Eight)! I've already pre-ordered my copy but it's not going to arrive until mid November – I honestly don't think I'll last that long :/ Great review! Yey! I'm glad you liked it (and so will I). OMG yeah you'll have to see if you can get that expedited! Haha! You shouldn't have to live without Eight for one more second!! So glad to hear that! It makes my heart happy that others are loving this like I did! SO EXCITING! Are you going to YALLfest too?? DUDE. I'm so so so SO happy you loved this as much as I did. COMPULSION FTW!!!!!! Fabulous review, Andye!!! <3 Eight!!!! Thanks Rachel! I hope you love it as much as I did! You'll definitely have to let me know! Wow, I am glad to see you enjoyed this book that much! I can't wait until I start reading it, once I am done with this book I will push it to the top of my TBR! Great review girl! I'm glad you liked it so much! I can't wait for Persuaion!